Listening to this new age woman traveler is like visualizing a travel diary. Slowly she begins, with her voice going high & low, moves to one story to another story with the same passion she had when she actually experienced it. Mini Khanna, 50, is not like the normal gung-ho person that you meet every other day. She is one of the new age travelers apart from being a working professional and a mother. She is a seasoned woman traveler. Sounds cliched? Hold on. Mini might be one of the few women on this planet who has traveled to all the states in India except the Far East. That’s no big deal, you may say. But hold on, what if we tell you, she has traveled to more than 32 countries – solo, group and of course with the family, that would sound interesting, isn’t it? Mini’s journey of journeys is indeed a story to be told. SelfRoadiez caught up with this energetic traveler who has defined that age is no barrier to travel and adventure. 24 states in India, 32 countries all over the world. How has the experience been? Mind-blowing is the word. Each and every trip was memorable for me. Be it solo, or with groups or with family. Travelling has been with me ever since I was born. Tell me about your childhood and how did this idea of traveling start? I was extremely fortunate to be born in a family where parents are equally interested in travel. 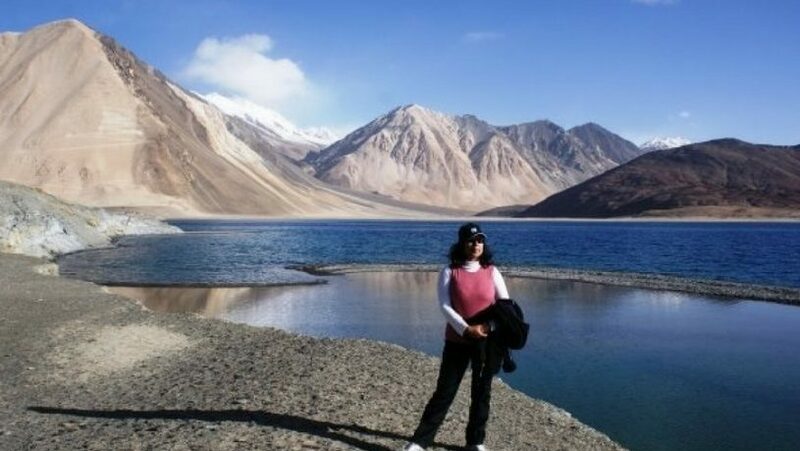 I was born in Maharashtra but due to the traveling nature of my Dad’s work, we ended up living in various parts of India.So that travel itch got imbibed in me from a very young age. What have been your earlier memories of travel? Well… I am not able to recollect the first trip that I have done. But, one of the most memorable trips is a trail through the interior villages of Maharashtra. You have traveled to 32 foreign countries by the time you crossed 50. That’s a feat. (Smiles) Incidentally, all these foreign trips happened in the past 17 years. This means all the foreign trips happened post marriage. I never traveled outside prior to that. Which was your first foreign trip? It was a trip to Nairobi and Uganda. This was planned for my son, Shlok, who got a feel for the wildlife. Later, Japan, Europe, China, Bhutan, USA, UK and many other places followed. You must have had some thousands of memories. Please share a few with our readers. There were pleasant as well as scary memories. One scary experience I can recollect happened in Scotland where I, Nilanjan and my son were on a vacation. Both my son and husband were not interested in going out. So I decided to go out myself. I took a bus to see the castles. But I was completely lost after traveling from one castle to the next one. I just kept walking and was not sure where I was heading. After almost four hours I heard a neigh of the horse. I could also see a horse hedge close to that. I had read somewhere that horse hedge indicates human life close-by. Thus found out that it was indeed true. Losing my way was one of the scariest experiences of my trips. I am sure you must have had some pleasant experiences too. I don’t know if this can be called pleasant. Whatever you may call it, this incident happened in Japan while I was on an official trip. I was working in Tokyo and took a bullet train to Nikko and Kinugawa, both in the Tochigi prefecture. I was staying at a Japanese Inn. These inns in Japan close at 7 PM. By the time I finished my dinner at a restaurant outside of the inn, it was 9 PM. When I reached my inn, nobody answered. Then I decided to stay at the railway station in the night. But after a while, the station master came and said that the station also closes at 11 PM. I didn’t know what to do. I tried to convince the station master in my own sign language but of no use. Later a lady who was sitting with me in the station waiting room came and offered help in her sign language. I was a bit skeptical as the area is quite synonymous with prostitution as well. But the night was so chill that I had to take a chance and go with her. But I must tell you, that was one of the most humane experiences I have encountered ever in my entire life. She took me to her house, gave food, place to sleep and dropped me back to the station where I had to take the train. Till now I had just read but this was my first-hand experience in a foreign country with humanity – it is not restricted by language, culture, creed or any other boundaries. How much have you evolved as a person during each travel? Even at this age, I am able to travel just because of this passion and interest that is still inside me. Life is a travel adventure. I have always loved meeting new people and understanding their cultures. Normally after a particular age, people change their genre of travel also. For instance, trek changes to pilgrimage, or solo changes to family etc. Ultimately it is the traveling experience that counts. I am fortunate to get a family who is equally adventurous as me even in this age. Even my son loves to travel. It is all about how and what you imbibe on them. Which was your last foreign trip that you have undertaken? My last foreign trip was to Bhutan, where I conquered a place in one day. It was supposed to be done in two days. The place is called Bumdra which is just above the Tiger’s nest. Coincidentally it happened on a Woman’s Day. Which countries are left on your itinerary? North East India is one area I am yet to explore. Hopefully soon, it will happen this year. So is Mount Kailash that will happen in the latter part of this year. Regarding foreign countries, the dream destinations include Machu Pichu, Door to Hell In Turkmenistan, Grand Canyon, New Zealand, Alaska, Antarctica to name a few. Trans Siberian travel is also on top of the list.